Most people would agree that holding a smartphone in portrait mode is the most comfortable way to use it. Here are five reasons why your chamber should consider shooting videos vertically if you don’t already. We all know that rotating the phone to landscape is possible, but one study found that 94% of smartphone users don’t want to do so. It becomes a hassle to rotate for a video. 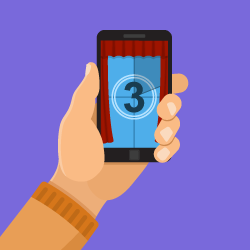 Vertical videos convert better – they have a 90% higher completion rate. Vertical fills the screen, without requiring the viewer to readjust their grip. It’s best for filming people because we are taller than wider; so it’s great for interviewing members or capturing a moment at your event. Vertical video offers an opportunity to direct the viewers’ attention to where you want it. Snapchat can take the credit for making vertical content popular -- first with photos, and then video – to post “Stories.” They forced users to film in portrait mode pushing it on millions of Millennials. It quickly became clear that vertical video is the preference on mobile, and other social media platforms have followed suit. There are countless vertical videos on the internet that appeal to mobile users and generate millions of views. It’s an important shift that your chamber should be a part of.